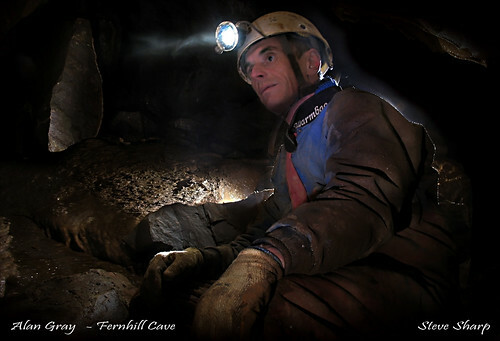 Just one answer - to find new caves or additional passages in existing caves. When visiting a caving area you may have seen a ragamuffin group of people dressed in their oldest filthy clothes, carrying various implements, spades, iron bars, drums etc. these people are cave diggers. * Upper Canada Cave. A Cave at Hutton near Weston S.M. blocked with mining debris since the 19th Century, with archaeological interest. * Axbridge Hill Cavern. A Cave at Hillside, near Axbridge with a large chamber, discovered by ochre miners, and blocked for many years. The majority of British caves are formed in Carboniferous limestone rock, which was deposited between 354 and 290 million years ago. In the early Carboniferous period Britain was close to the equator and was subject to a tropical environment. During this period 100s of metres of limestone, which is formed from compressed sediments and marine life, were formed. This limestone is naturally fractured joint (vertical) and bedding plane (horizontal). The landscape of Britain slowly changed, firstly by uplift of mountainous area and the sinking of other areas, which changes the flow of rivers. Secondly by weathering and thirdly by glaciers. Caves were formed by rivers and streams sinking through the joints and bedding planes in the limestone thus causing enlargement and the deposition of mud and boulders. This blocked off passages within caves and sometimes even disguised the entrance to caves making them indistinguishable from the surrounding countryside. As stated before cavers dig to remove these blockages, to find new passages and new caves. They are the eternal optimists; at the start of each digging trip always thinking that today we will break into new cave passage or find a new cave. Cave digging can be a quick process perhaps only a few hours can lead to a breakthrough. However, usually the dig is over a long period. One cave on the Mendip Hills in Somerset has been dug by a succession of cavers for over 100 years! One final observation cave diggers are enthusiastic, probably obsessive, they spend more time thinking, planning and speculating about the dig than actually physically digging!